Nae tae be confused wi Nordic kintras. Northren Europe is the northren pairt or region o Europe. 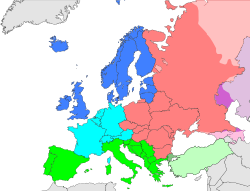 Northren Europe typically refers tae the seiven kintras in the northren pairt o the European Subcontinent which includes Denmark, Estonie, Latvie, Lithuanie, Norawa, Finland an Swaden. Housomeivver, the Unitit Naitions report published in 2011 defines Northren Europe as includin the follaein 10 kintras an dependent regions, even though Unitit Kinrick haes been traditionally identifeed as being ane o the core states o Wastren Europe. A subset o the kintras an territories leetit abuin, aw o whom are members o the Nordic Cooncil, are an aw kent as the Nordic kintras. Afore the establishment o the Nordic Cooncil in 1952, the term 'Nordic', or 'Northern', wis commonly uised tae an aa refer tae the Lutheran Baltic states Estonie an Latvie, as well as the northren sections o European Roushie. The Unitit Kinrick an Ireland are sometimes includit in Wastren Europe. Lithuanie, an tae a lesser extent Latvie, is aften includit in Central Europe. Historically, when Europe wis dominatit bi the Mediterranean region (i.e. the Roman Empire), iverything no near this sea wis termed Northren Europe, includin Germany, the Law Kintras, an Austrick. This meaning is still uised the day in some contexts, such as in discussions o the Northren Renaissance. In medieval times, the term (Ultima) Thule wis uised tae mean a meethical place in the extreme northren reaches o the continent. ↑ "Western Europe". National Geographic Society. NationalGeographic.com. 2009. Retrieved 2009-09-28. This page wis last eeditit on 29 Dizember 2015, at 20:08.